Contr. Toward a Monogr. of N. Am Sp. 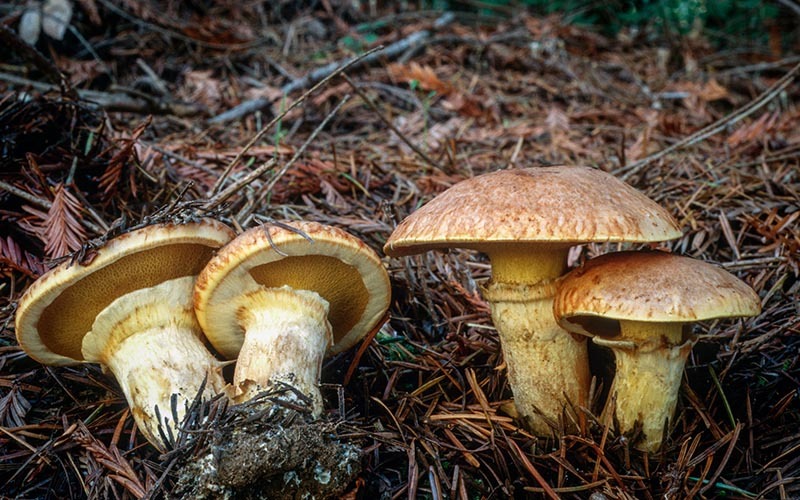 of Suillus, p.36. 1964. 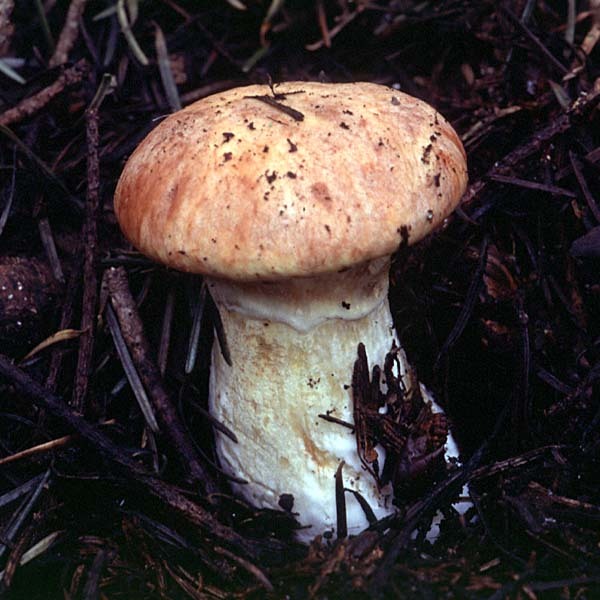 Cap 6-13 cm broad, convex, nearly plane in age, sometimes slightly lobed or with a wavy margin; surface viscid, tawny-brown at the disc, lighter at the margin, streaked with innate, peach-colored fibrils over a lighter background; flesh thick, soft, pale yellow to lemon yellow, not turning blue when cut; taste mild, odor harsh. 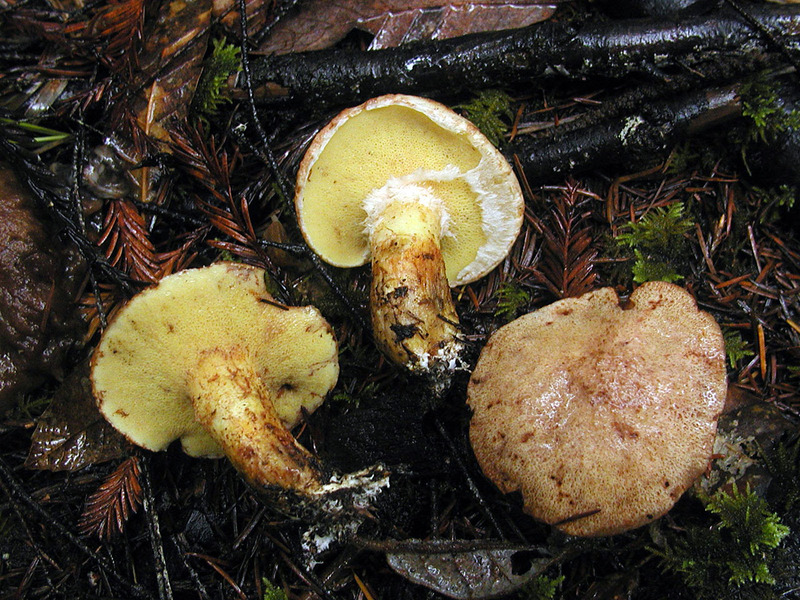 Tubes adnate to slightly decurrent; pores at first yellow-brown becoming dingy yellow brown, bruising darker where handled, approximately 1 mm in diameter at maturity. 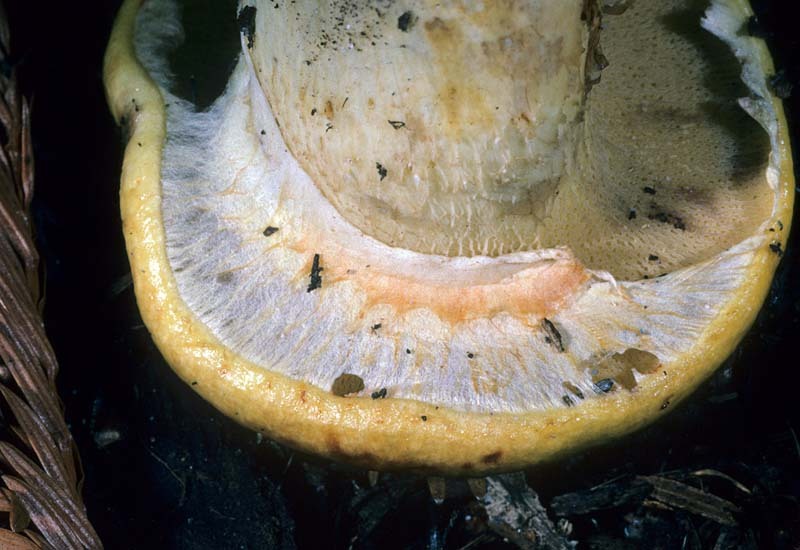 Stipe 2-7 cm tall, 1-3.5 cm thick, solid, stout, equal to tapered towards the base; surface reticulate near the apex and pale yellow, fibrillose and drab below, discoloring brown where handled; veil fibrillose, white to dull yellow, forming an evanescent superior annulus or leaving fragments on the cap margin; tissue at the base turning blue when bruised or cut. 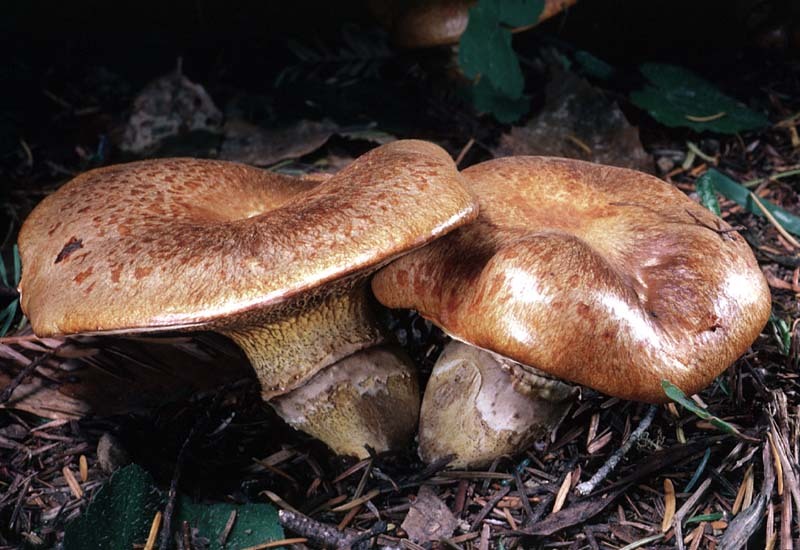 Spores 6.5-9.5 x 3-4 µm, elliptical, smooth; spore print cinnamon-brown. Scattered to gregarious under Douglas fir (Pseudotsuga menzesii); fruiting from late fall to mid-winter. Edible but of mediocre quality; lacking in texture and subject to infestations of fly larva. 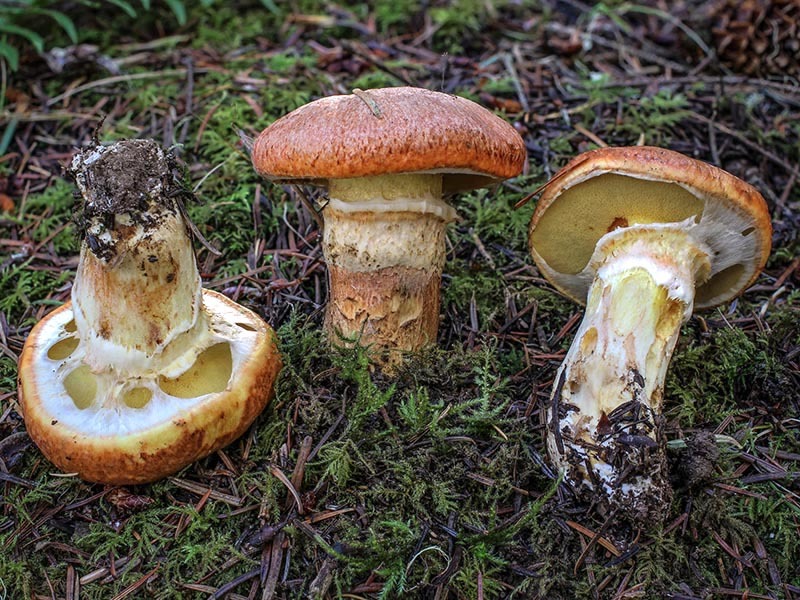 Suillus caerulescens is recognized by a viscid, innately streaked, yellow to tawny-brown cap, fibrillose veil, and blueing of tissue at the stipe base. 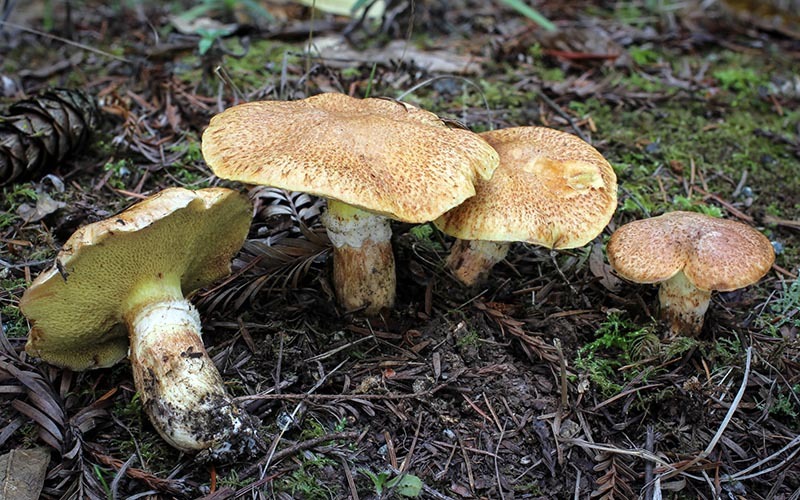 Suillus ponderosus is closely related and sometimes occurs with S. caerulescens under Douglas fir, but it has a viscid, yellow to tawny-brown annulus, and the cap is less streaked.